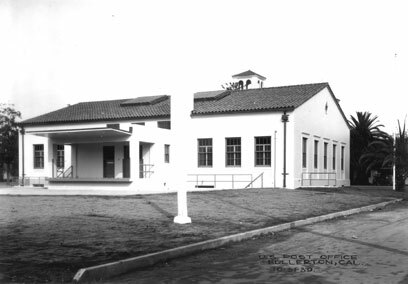 The Fullerton Post Office, a neat, attractive example of the Spanish Colonial Revival style applied to civic architecture, was one of a number of Depression-era government relief projects completed in Fullerton in the 1930s and 1940s. It was placed on the National Register of Historic Places on August 28, 2012 for both its architecture and interior mural. Although the building is often categorized incorrectly as a Works Project Administration (WPA) structure, it actually was designed by the United States Treasury Department's Office of the Supervising Architect. The Office of the Supervising Architect's plaque is positioned on the front of the building. 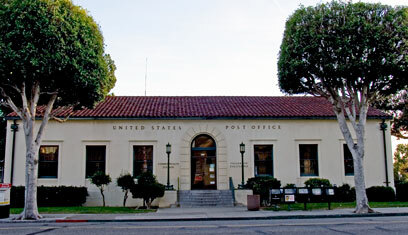 The Fullerton Post Office (202 East Commonwealth Avenue), the only federal building in Fullerton, was constructed in 1939. Situated on a 130- by 175-foot corner lot, the 6,000-square-foot Spanish Colonial Revival Post Office is a single-story reinforced concrete structure with a full basement. Spanish Colonial Revival design characteristics include an arched entryway, a low-pitched pantile roof (with two skylights), decorative iron work, and flat stuccoed surfaces. The building's stuccoed exterior, plastered in a flat, plain pattern, is painted off-white and the trim is a dark green. Basically rectangular-shaped, the structure faces north. Fireproof throughout, the interior is an example of the standard interior plans used by post offices during the 1930s. A relatively small portion of the interior is accessible to the general public; the bulk of the interior is devoted to the processing of mail by federal employees. Nearly all of the interior's design features are concentrated in the public areas, with the public space finishings of dark wood and terra-cotta wainscoting contrasting with the more functional and open arrangement of the workrooms where mail is processed. Ten months after town founders George (1855-1947) and Edward Amerige (1857-1915) laid out the townsite of Fullerton, the federal government approved a post office for the small town, appointing Edmond E. Beazley (1863-1947) as the first postmaster on April 13, 1888. For the next fifty years, the post office, mirroring the growth of the community, moved to seven different locations in the downtown area. On May 22, 1888, the first post office opened in the Ford Grocery Store and shortly thereafter moved to the well-known Sterns & Goodman Grocery Store, both located in the Wilshire Building, situated on the corner of Spadra (now Harbor) Boulevard and Commonwealth Avenue. Total income for the first year was $242.31, and the postmaster's salary was $292.55. In 1892, William Starbuck (1864-1941), a druggist, took over as postmaster, and his store, the Gem Pharmacy, which moved three times during the next twenty-five years, became the new post office location. In 1889, Starbuck drove his horse and buggy to obtain the necessary 100 signatures needed to obtain free rural delivery of mail. Fullerton secured the first Rural Free Delivery (RFD) route in Orange County, and one of the first routes west of the Mississippi. By 1901, Fullerton's petroleum industry was booming, and a second RFD carrier, at $500 per year, was hired to service a 23-mile oil well route. Eventually, there were seven rural routes out of Fullerton. In 1913, hundreds of Fullerton residents put up mailboxes and free city delivery began with three deliveries daily in the business district and two in the residential district. Residents continued to receive mail twice a day until the 1980s. From 1917 to 1927, the post office was located in the Schumacher Building (212-216 N. Spadra), and from 1929 to 1939 on the first floor of the Fullerton Odd Fellows Temple (112 E. Commonwealth), now the Williams Building. began to agitate for a postal building. Galvanized by an editorial in the November 15, 1933 Fullerton Daily News Tribune ("Why Not Fullerton?") that noted "Fullerton is one of the few cities of its size in California that has no post office building," the Fullerton Chamber of Commerce appealed to Republican Congressman Samuel L. Collins (1895-1965) to place Fullerton on the preferred list of federal post office projects, but that attempt failed in 1935. Undeterred, the Fullerton Chamber of Commerce spearheaded another post office drive in February 1936. Chamber head Harry F. Smith appointed a citizens' committee, chaired by Albert L. Foster (1898-1977), who again joined forces with Collins. On September 10, 1937, it was finally announced that Fullerton was approved for a new post office. The new structure would mark the first time that the community had a building erected exclusively for the purpose of being the post office, and its construction was closely watched by residents and local newspapers. Fullerton residents wanted the new post office centrally located, near the railroad station, and preferably on a corner lot for easy access. All of those requirements were met when postal authorities authorized the purchase of two residences on the northwest corner of Pomona and Commonwealth Avenues for $19,000, and demolition began in 1938. When plans for the Post Office were completed by the Office of the Supervising Architect, bids for a contractor went out in February 1938, and San Diego resident George Goedhart (1901-1980) was the successful bidder at $54,950. The fixtures, furnishings and new equipment increased the building total to $91,000. Goedhart specialized in federal building construction and had already completed post offices in Colusa and Susanville (1938), California and Valentine, Nebraska (1936), and would go on to construct post offices in Buhl, Idaho (1939) and Lancaster, California (1941). Post offices constructed by Goedhart had standard floor plans and exterior designs that conformed to local or regional traditions. Forty Fullerton laborers were hired, including Albert L. Foster, who won the excavation and sand and gravel contract. Construction began on April 3, 1939, and was completed in seven months. In a pageant-filled ceremony on June 3, 1939, Fullerton Masonic orders laid the cornerstone for the new building, and an equally elaborate dedication ceremony took place on October 28, 1939. On Friday November 19, 1939 at 1:00 p.m., postal workers closed their leased quarters in the nearby Odd Fellows Temple and moved into the new post office, half a block away, opening for business on Monday, November 20, 1939. 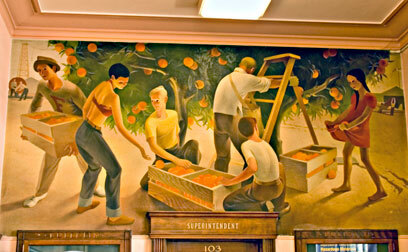 In 1942, an oil and canvas mural ("Orange Pickers") painted by Paul Julian, was added to the interior of the post office. When completed, the Post Office and interior mural brought to the community a symbol of government efficiency, service, and culture. When the post office was constructed in 1939, Fullerton residents believed it would be the only post office the city would ever need, but by the 1960s, it was apparent that a larger postal facility was needed. 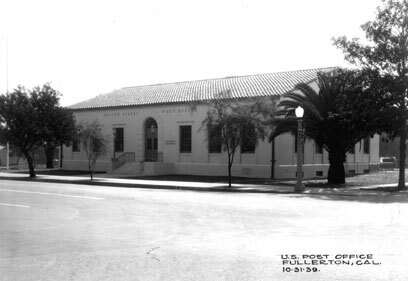 The Commonwealth station served as Fullerton's main post office until 1962 when a larger building was leased at 1350 East Chapman. In November 1941, Paul Julian, then one of Southern California best-known young artists, was commissioned by the U.S. Treasury Department Section of Fine Arts to create a mural for the Fullerton Post Office. Julian painted the 6- by 13-foot oil on canvas mural in the WPA Federal Arts Project studio in Los Angeles, and the mural was transported and installed in 1942. The Fullerton Post Office was not originally designed to accommodate public art so similar to other Class B and C post offices constructed during the Great Depression, the mural was positioned in the only spot available—the long narrow space above the postmaster's doorway. Julian's painting is one of three Depression-era murals in Fullerton, but unlike the other two—Charles Kassler's "Pastoral California" (1934) commissioned by the Public Works of Art Project (PWAP) and Helen Lundberg's "History of Southern California" (1941) funded by the Work Projects Administration Federal Art Project (WPA/FAP)—which were later painted or boarded over, then restored, the Julian mural has remained untouched and in excellent condition. Titled "Orange Pickers," the mural depicts four young men and two young women picking oranges from two trees, then packing them into a wooden crate. One of the male figures on the left wears a sweatshirt bearing the letter "F" indicating that he is either a student at nearby Fullerton Union High School or Fullerton Junior College. Citrus crops were still the driving force of the Fullerton economy when the mural was painted, but the town's two other major industries—oil and aeronautics—are also depicted by two men working an oil well in the southwest (left) corner and a man, two airplanes, and a hangar in the northwest (right) corner. Because of the small space available to Julian, the orange trees are positioned in the center of the mural so that the eye is first drawn to the middle of the painting, and then moves out to the rest of the picture. Fairly small in scale with a quiet composition, the mural is highlighted by color, particularly in the oranges and clothes of some of the pickers, which adds vibrancy to the painting. The mural employs a primary palate of green, brown, blue, red, and yellow. Similar to many government-sponsored murals, "Orange Pickers" presents an optimistic and reassuring view of the community at a time when Fullerton residents were suffering from severe economic stress. "Orange Pickers" is representative of the historically based, regional, illustrative realism that was funded under the Section of Fine Arts. Although Fullerton residents have long enjoyed the mural's portrayal of community history, townspeople over the decades have also pointed out the inaccuracies of the painting's minor features. The ladder used is a step ladder, not the usual 3-foot wide and 15- to 18-foot tall straight ladder that allowed picking at the tops of the trees and simply leaned against a tree. Field boxes used to store oranges were shallower, heavier, and had grips on the ends to make stacking easier. Orange groves were not planted on flat land, but instead had furrows in rows among the trees for irrigation and to prevent runoff. Orange picking was dirty, scratchy work and workers wore long sleeves, hats, gloves, and boots, not the halter tops and short-sleeved shirts worn by pickers in the murals. The pickers are also Anglo at a time when most of the orange grove workers were of Mexican or Japanese descent. Fans of the Fox Fullerton Theatre will frequently point out the building's connection with the Hollywood film industry, but the Fullerton Post Office on Commonwealth Avenue has an equally important link with the movie industry. The canvas mural on the west interior wall was painted by Paul Julian (1914-1995), a brilliant and seminal background artist for animated films. After Julian completed the post office mural in 1942, his last public art project, he went on to create layouts and backgrounds for dozens of Warner Brothers Pictures Merrie Melodies and Looney Tunes cartoons, featuring such iconic characters as Bugs Bunny, Sylvester, Tweety Bird, Daffey Duck, Porky Pig, Yosemite Sam, and Elmer Fudd, while also working on several Columbia Pictures Mr. Magoo cartoons. When Warner Brothers began producing Road-Runner cartoons in 1949, it is Julian's voice that is making the distinctive "beep-beep" sound of the Road-Runner. Two of the animated films Julian helped to create at the United Production of America (UPA) Studio, The Tell-tale Heart and Rooty Toot Toot, were nominated for Oscars. When movie studios stopped producing cartoons, Julian moved into television and film, working on a number of television series, including Jonny Quest (1964-65), The Bugs Bunny Road Runner Hour (1968), Valley of the Dinosaurs(1974-75), The Sylvester and Tweety Show (1976), Dungeons and Dragons (1983), Alvin & the Chipmunks (1984), Mister T(1984), and Dragon's Lair (1984-85). Born Paul Hull Husted, Paul Julian was born June 25, 1914 in Illinois. In 1920, Julian's mother, Esther (1893-1979), remarried a man named Frank Julian, and Paul and his brother Harry Husted took their stepfather's surname. The family moved to Santa Barbara (814 W. Valerio Street) in 1922. A child prodigy, Julian took night classes at the age of 13 at the Santa Barbara School of the Arts, studying with Belmore Brown, Charles Paine, and his mother, who had herself studied at the school. After his graduation from high school in 1933, Julian studied at the Chouinard Art Institute in Pasadena where he worked with Millard Sheets and Lawrence Brown as a scholarship student until 1936. That same year, he took first prize at the California State Fair, and in 1937, at the age of 25, he had his first formal exhibition in Santa Barbara where he showed the maritime paintings he had initially become known for along with more complex works. After completing his education, Julian found that the economic conditions created by the Great Depression limited his artistic activities, and he turned to the Work Projects Administration Federal Art Project (WPA/FAP), a Depression-era welfare program for artists that ran from 1935 to 1943. Unlike established and significant artists of the period, such as Rockwell Kent, Thomas Hart Benton, and Maynard Dixon, who relied on federal relief aid for artistic survival, Julian used New Deal funding to establish himself as an artist. As a young artist, Julian was trying to gain a foothold in the art community while employed by the federal government, and the support and sponsorship he received from the WPA/FAP actually provided him with needed promotion and recognition. His first measure of success came from the public art shows where his work was displayed next to established artists and then from the recognition of his murals. He initially completed paintings for the Easel Unit, a number of which were purchased by schools and other institutions around Southern California. His WPA/FAP works were also featured in exhibitions, including the important Southern California Art Project Exhibition at the Los Angeles Museum in 1939, which featured major Southern California artists, and Frontiers of American Art, a national exhibition of the Federal Art Project at the M. H. de Young Memorial Museum in San Francisco. These exhibitions, and the murals that followed, began to establish Julian as one of the foremost young artists in Southern California. In July 1937, Julian received his first mural commission. He was hired to paint a mural at the Santa Barbara General Hospital, now the Santa Barbara County Psychiatric Health Facility, located at Calle Real and San Antonio Road. The mural ("Picnic on a Cliff"), in a large hall above three archways, depicts a group of young people enjoying a picnic. Created with oil pigments mixed with beeswax, which prevented the paint from drying with a gloss, the mural was based on Julian's boyhood memories of Santa Barbara. He also designed large, half-scale drawings for a mural at the National Guard Armory on East Canon Perdido Street in Santa Barbara, but lack of funding prevented their execution. Julian's last WPA/FAP work in Santa Barbara was an assignment from Buckley McGurrin on a project planned by Stanton MacDonald-Wright (1890-1973), who headed the Southern California Federal Arts Project. MacDonald-Wright was designing enormous tile decorations for the Santa Monica City Hall, and the work was sub-contracted out to several FAP artists. McGurrin assigned Julian a small parcel of decorative work using re-glazed tile, which Julian then turned over to others in Santa Barbara. When WPA/FAP projects dried up in Santa Barbara, Julian moved to Los Angeles in 1939 (4957 Melrose Hill). His first assignment was to execute four 10- by 10.5-foot panels for a U-shaped courtyard on the exterior south wall of the new auditorium at the Upland Elementary School (605 5th Avenue). Using MacDonald-Wright's new petrochrome medium, the murals were created in a rented storefront with the help of seven or eight studio crew members, then transported to the school and hung. The four panels of the mural ("The History of Upland") feature separate scenes of Indians, padres, pioneers, and orange pickers. The outdoor mural, which is somewhat faded, but still in good condition, was made using 24 different colors of ground marble, as well as ground abalone shells, moonstones gathered at the beach, and petrified wood. In 1940, Julian married Consuelo Cheever (1916-1998), whose father Walter (1880-1951) taught at Santa Barbara State College from the late 1920s to 1944. Consuelo Julian had studied at Mills College in Oakland under Robert Stackpole (1885-1973). An influential painter, muralist, and sculptor, Stackpole had been responsible for bringing Diego Rivera (1886-1957) to San Francisco to paint murals. At Stackpole's suggestion, Julian entered his designs in the national competition for the Rincon Annex Post Office in downtown San Francisco. Julian was the only California artist to receive honorable mention in the competition. As a result of this honor, the Treasury Department Section of Fine Arts awarded him a commission to paint a mural for the Fullerton Post Office in November 1941. Julian painted the 6- by 13-foot oil on canvas mural in the WPA Federal Arts Project studio in Los Angeles, and the mural was transported and installed in 1942. Similar to the Upland "Orange Pickers" panel, Julian fleshed out the Fullerton mural with additional figures, using warm and mellow colors. Julian used the money from the Fullerton mural to pay for the birth of his first child. In October 1939, Julian was hired to work as a layout and background artist by Leon Schlesinger Productions, the studio that produced shorts for Warner Brothers Pictures (Warner Brothers later purchased the entire studio), and Julian embarked on a new career in the animation field that was to last the remainder of his life. At the time, the studio's background department painted all the backgrounds for each short, which tended to make them all look alike. Layout artist John McGrew (1911-1999) decided to modernize the standardized look of Warner Brothers cartoons by assigning a background artist to an individual director and his unit. A novel idea at the time, it signified the increasing awareness in the industry about the importance of background styling. Looking for modern background painters who would translate his layout designs with imaginative painting techniques, McGrew recruited Julian. Working with legendary directors Chuck Jones (1912-2002) and Isadore (Friz) Freleng (1906-1995), Julian created distinctive background paintings for dozens of classic Merrie Melodies and Looney Tunes Cartoons, including such classics as Baseball Bugs (1945), Racketeer Rabbit(1946), Tweetie Pie (1947), I Taw a Putty Tat (1948), Bad Ol' Putty Tat (1949), All a Bir-r-r-rd (1950), Golden Yeggs (1950), Ballot Box Bunny (1951), etc. Julian's dramatic background layouts, unique creative color styling, and ability to work in a wide variety of styles made him ideally suited to creating animated shorts. On average, Julian created 45 to 60 paintings (9 to 12 a week) for each cartoon. Many of the Warner Brothers classic cartoons for which Julian provided backgrounds are found in Volumes I and II of the Looney Tunes Golden Collection, a DVD set produced by Warner Brothers Pictures and available in the Fullerton Public Library. While working at the Warner Brothers Studio, Julian "out of sheer exuberance or silliness" and to alert co-workers to stay out of the way because he was carrying a large background painting, would make a "beep-beep" sound (Julian described it as more of a hwbeep-hwbeep sound). Julian's daughter Alison also remembers her father making the same beep-beep sound when he went down the crowded hallway in their home. Searching for a sound to represent a new cartoon figure of an ostrich-necked road runner, Mike Maltese (1909-1981), an animation writer working for director Chuck Jones, heard Julian and decided to incorporate his beep into the new cartoon character. Working with Treg Brown, the sound effects editor, Julian spent an afternoon recording beep-beep into a microphone, then playing it back at various speeds. The result was the distinctive "beep-beep!" sound made by the Road-Runner in Warner Brothers' cartoons. Julian received no money or film credit for his Beep-beep sound because he was not a member of the Screen Actors Guild. Julian also fancied himself a graphologist, a handwriting expert. While at Warner Brothers, Julian's female co-workers at Warner Brothers would often give him samples of their boyfriends' handwriting to analyze. During World War II, Julian began moonlighting at Industrial Film and Poster Service, the forerunner to Hollywood's revolutionary United Productions of America (UPA) Studio, where he made military training films, including the influential Flat Hatting (1944). He also provided background paintings for two films commissioned by the United Auto Workers: Hell-Bent for Election (1944), directed by Chuck Jones and produced to support Roosevelt's presidential reelection, and Brotherhood of Man (1946), which advocated racial equality. After the War, Julian bounced between Warner Brothers and UPA until the 1960s. Founded in 1943, UPA, which produced shorts for Columbia Pictures, revolutionized the animation field by producing more personally expressive shorts, and Julian preferred UPA's open attitude toward exploration, graphics, and inventive material. UPA was often referred to as the "Layout and Background Studio" by other artists because of its almost religious devotion to designing backgrounds and settings. Working as a color stylist, designer, and layout artist, Julian achieved fame for his work on the Studio's Mr. Magoo, Jolly Frolics, and UPA Cartoon Specials series. Among his Mr. Magoo cartoons, UPA's most successful and popular creation, were such entertaining films as Fuddy Duddy Buddy (1951) and Hotsy Footsy (1952). In 1952, Julian provided color and design for Rooty Toot Toot, a Frankie and Johnnie story that showcased UPA's distinctive stylized line-drawing animation. A classic of modern animation, the film was featured in a full-color spread in the March 10,1952 issue of Life magazine, and would go on to be nominated for an Academy Award. That same year, Julian collaborated on another piece of animation that won wide acclaim for UPA: the main titles and animated linking segments in Stanley Kramer's live-action feature, The Fourposter. Julian's most famous work at the UPA Studio followed in 1953 with his paintings for The Tell-Tale Heart, an adaptation of the Edgar Allen Poe short story. A pioneering attempt to adapt cartoon techniques to serious drama, The Tell-Tale Heart was also featured in a full-color spread in the September 7, 1953 issue of Life and was nominated for an Academy Award. Although it was released to the public in a flat format, The Tell-Tale Heart has the distinction of being the first animated film shot in a 3-D format. Julian also directed two films (while also doing color and design) for UPA: Baby Boogie (1955) and The Hangman (1964). Although not of high quality, a number of Julian's shorts from this period are available on the Internet at YouTube, including Hell-Bent for Election, Brotherhood of Man, Rooty Toot Toot, The Tell-Tale Heart, and The Hangman. Julian's work is also showcased on a DVD, the UPA Jolly Frolics Collection, available in the Local History Room of the Fullerton Public Library. When work in film cartoons dried up in the 1960s, Julian quickly and successfully moved into television and film. He worked as a background and layout artist for a number of television series, and also served as background artist and later art director at Hanna-Barbera Productions. He contributed to the studio's success on the Saturday-morning cartoon series Herculoids (1966-69), and two full-length animated features: The Man Called Flintstone (1966) and Charlotte's Web (1973). He also worked as art and production designer on feature-length films, including Metamorphoses(1978), which blended six familiar Greek and Roman myths, Winds of Change (1979), an anime fantasy, and FernGully: The Last Rainforest (1992). Although Julian worked in a number of animation fields, viewers watching his animated shorts and features can quickly spot his unique style and colorfully hued backgrounds. Both admired and respected by his industry peers, Julian was elected to the Board of Governors of the Motion Picture Academy of Arts and Sciences, representing the Short Films Branch from June 1975 to May 1977. In 1980, Hollywood's International Animated Film Society (ASIFA) recognized Julian's immense accomplishments in the field of animation, honoring him with its Winsor McCay Lifetime Achievement Award. The ASIFA honor marked the first time that a background artist was given an Annie, animation's highest award. Julian continued to work as a background artist and art director until his death on September 5, 1995 in Van Nuys, California. Additional information and photographs of the Fullerton Post Office will be found in the Local History Room of the Fullerton Public Library.